L-R Owners of Salt 360 Cassidy Bruno, Rocco Bruno, and Patti Salomon at the Salt360 Float Studio on north Main Ave.
Why did Salt 360 decide to be an independent business? Patti Salomon: I think it’s because we have more control over what we wanted to do. Ultimately we get to make our own decisions and we don’t have to follow anyone’s rules. 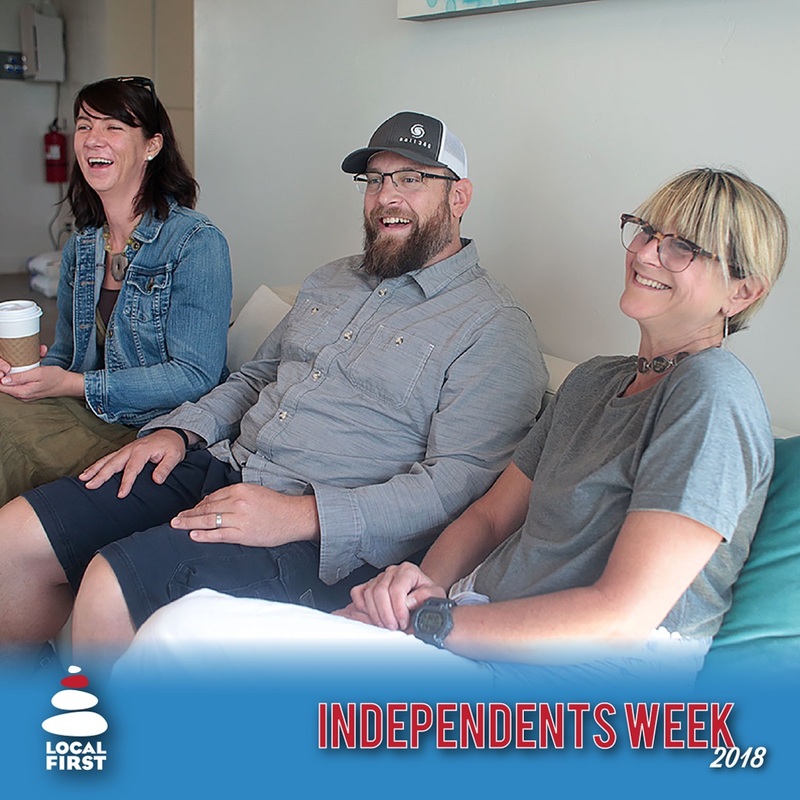 We also really wanted to be a part of the community here and in Durango when you’re locally owned, you’re more supported by the local community. What do you think you are able to offer in products/services as an independent business that your competitors couldn’t? Rocco Bruno: Our float center is one of the first here in Durango, so right now we are the only ones offering a float experience. It’s something you can only do here because you can’t really go buy thousands of pounds of epsom salt and put it in your bathtub so we feel like we can offer something different. This is an experience where you’re enclosed, there’s no sound, no light, there’s 1,000 pounds of epsom salt so you get the benefits of the epsom salt too. In all, you get the benefits of the total retreat and for 90 minutes you get to take a break from the world. If people have fears, what do you want people to know? Cassidy Bruno: It’s a totally safe space and It’s your space for you to do whatever you want for 90 minutes. We just provide a facility that is completely deprived of sensory and sensory inputs. You’re in darkness with no light and if you’re scared initially you can leave the doors open or crack them if you want. We’re just here to facilitate a nice experience. P.S. : But there really is nothing to be scared of—it’s temperature controlled, you float, you can’t sink, so there’s no reason to be frightened. R.B. :But it really does take a couple times, sometimes we say three times because the first time you’re not quite sure what it is and do have some anticipations, but once you get in there and get a feel it’s really great. You do kind of have to get used to floating and trying it out helps you get used to it and by that third time you can really start to unwind and see some of those benefits. And also we did take some of those precautions into mind. We bought the best tanks—the tanks that we bought are UL listed so everything our vendor did to build these tanks prioritized “safety first” so there’s no skipping anything. The pads of the tanks are 99.99 percent disinfected between each float and we have handrails in the tanks, so it was “safety first” when we designed these tanks and that’s really what we want is a safe environment. We’ve done everything we could to make it safe and comfortable and people can rest easy that we put in the work to do that for our environment—it’s really up to the individual to come and once it’s dark and you’re alone, you actually open up instead of getting scared. P.S. : We’ll participate in the downtown activities for sure. With the fires I think it’s really important to support the community and I think the town is putting a lot effort into that and so we want to be a part of it in some way.